Guests: Steve Blair of Blind Brothers Arizona, and Roger Barton of Badger Roofing. Guest: A Hammertime Field Trip to Amish Home Decor. Guest: Matt Brassard on the Enchanted Christmas & the Whiskey Row Boot Drop. Guest: Mike Menlove of Menlove Law. Guests: Jessi Hans & Allison Lenocker of the Coalition for Compassion and Justice. Guests: Grant Quezada & Jessie Burke of the John Hancock Barbershop & Founding Fathers, and Mike Daniel of Ability Remodeling. Guests: City of Prescott Chief Building Inspector Paul McCarry, and Community Development Director Bryn Stotler. Guest: Christy Board of Board by Board Builder. Guests: Prescott City Councilwoman Alexa Scholl, and City of Prescott Recreation Services Director Joe Baynes. Guests: Lucy Leyva of Maid To Order & MTO Janitorial, and Erik Turnbull of Able Saw. 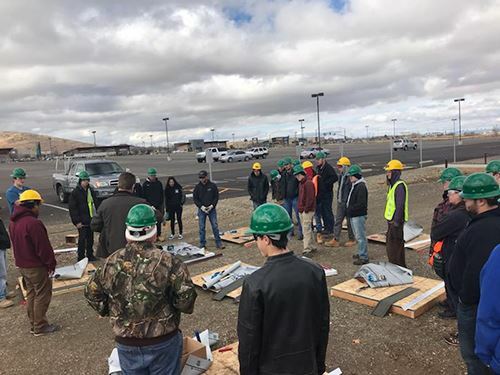 Guests: Chuck Merritt of DeCarol Company General Contracting, and Marc Vetere of Manzanita Landscaping. Guest: Joshua Lewis of Foxworth-Galbraith. Guests: Jeremiah King of the Central Arizona Honor Guard, Lew Reese of the Daily Courier, and Advocate for the Homeless, Daniel Matteson. Guests: Doug Reed of Tour Prescott, and Chris Kuknyo of Ride Prescott. Topics: Hope Fest, and Humboldt Unified School District Child Nutrition Department. 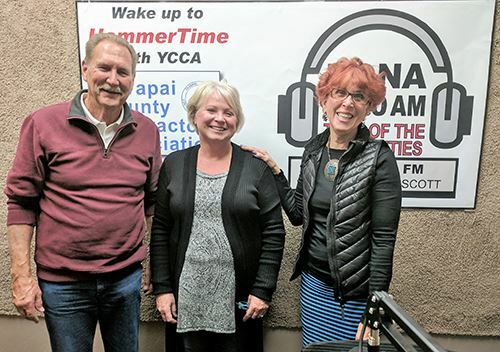 Guests: Bob Bean of Affinity RV, and Nancy Hamerly of Yavapai Big Brothers/Big Sisters. Guests: Michael Longoria & Lee Hoekstra of The Capitol Canyon Club. 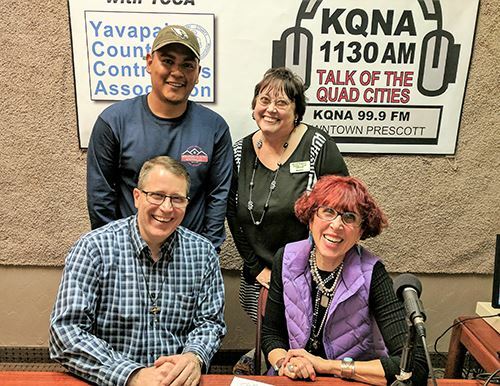 Guest: Temmy Bowler & Jarvell Williams of the United Way of Yavapai County. Guest: Lee Divelbiss of Armor K9 Protection Dogs. Guests: Toni Tennille & Henry Flurry on the AZ Phil (Philharmonic Orchestra). Heidi Dahms Foster, Town of Prescott Valley Communications Relations Coordinator. 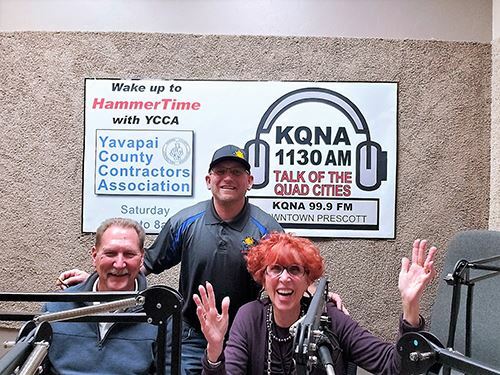 Guests: Tyler Goodman of the Prescott City Managers Office, and City of Prescott Code Compliance Inspector Wendie Laughlin. Guests: Leslie Jenkins of The Event Spot, and Rodger Barton of Badger Roofing. Guests: Matt Greenlee of Greenlee Designer Surfaces, and Greg Barstad of Granite Basin Roofing. Guest: Marc Vetere of Manzanita Landscaping. Guests: Mike Moyer of Moyer's Heating & Cooling, and Gillian Haley of Haley Construction. Guests: Chris Barrett of Barrett Floors, and Phil Stephens of Prescott Cabinets. 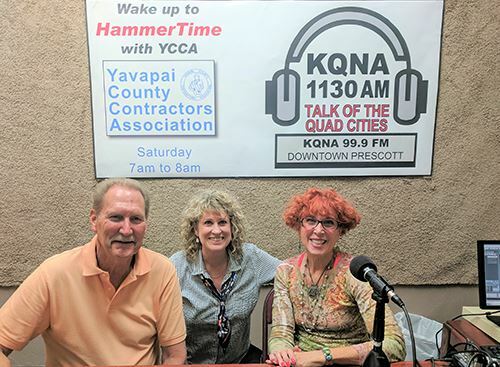 Guest: Ragen Hamilton of Prescott Valley Heating & Cooling. Guests: Dusty & Dee Spitler of A to Z Hearing, and Britt & Mike Flores of Peace, Love and Baking Co. Guest: Deborah Peterson of Coach Clarity By Definition. Guest: Dana Weary of Precision Fitness Testing on The Bod Pod. Guests: Roger Barton of Badger Roofing, Cody Anne Yarnes of Gripstone Climbing Gym, and Tom Riley of Renovations. Broadcast from the 40th YCCA Home & Garden Show. 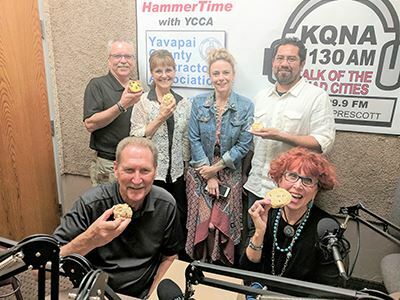 Guest: Laura Norman of the West Yavapai Guidance Clinic. 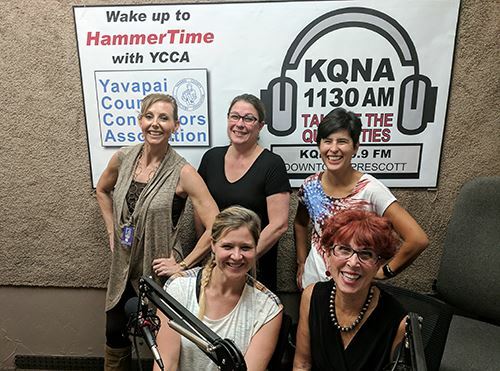 Guests: Juliana Goswick of Yavapai Big Brothers/Big Sisters, and Nadine Ramirez of AmeriPsych. Guests: Noline Evertt of Hometowne Cruise & Tour Center, and Juan Banderas of Sebastian And Sons Roofing. 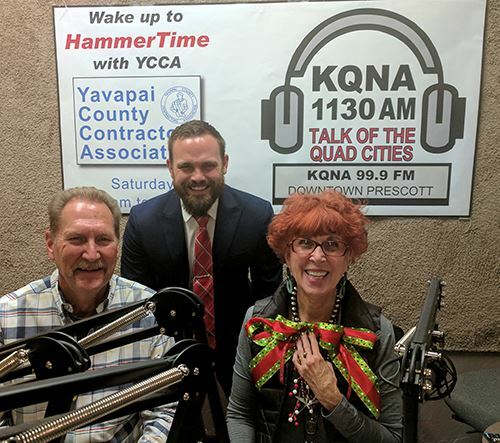 Guests: Yavapai County Administrator Phil Bourdon & Public Information Officer David McAtee, and Prescott Salvation Army Public Outreach Coordinator Michael Beauchamp. Guest: Janet Conrad of Arizona Breeze Retractable Screen Doors. Guests: Richard Mull & Walt Lynn on the 1st annual Southwest Checker Cab Cruise In, to benefit the DAV. Guests: Tony Yaniro of the Gripstone Climbing Gym, and a Field Trip to Foxworth-Gaibraith Home Improvement Center. 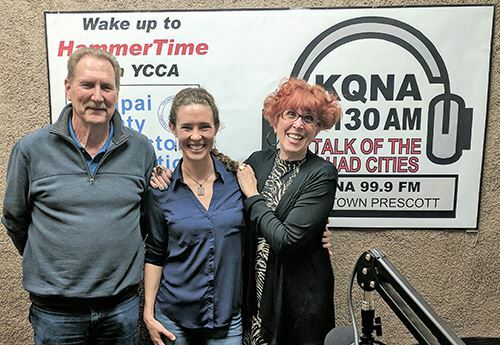 Guests: Cody Anne Yarnes of Realty Executives, and Dr. Dean Bado of Prescott Valley Chiropractic. Guests: Connie Manning of AAA Auto Club, and James Godbey & Katie Arrington of Fry's Clicklist. Guest: Chris Welborn of Vicente Landscaping. Guests: Prescott City Manager Michael Lamar, and Mayor Greg Mengarelli. 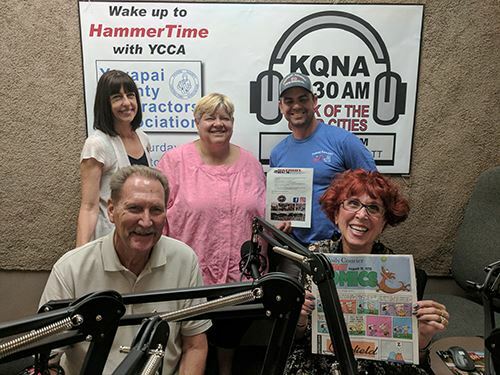 Guests: Yavapai County Administrator Phil Bourdon, Yavapai Country Supervisor Rowle Simmons, & Public Information Officer David McAtee, plus a Hammertime road trip to Builders Wholesale. Guests: Travis Stedman of Arizona Seamless Gutters. Guests: Ragen Hamilton of Prescott Valley Heating & Cooling, and Garth Bascom,Director of Human Resources for Fann Contracting. Guests: Yavapai County Supervisor Tom Thurman, Sheriff Scott Mascher, & Public Information Officer David McAtee. Guest: Betty Winn of the Winn School of Real Estate. Guest: Voluntary Services Manager Northern Arizona VA Health Care System Patricia Aljets. Guest: Steven Lynch of Heritage Roofing. 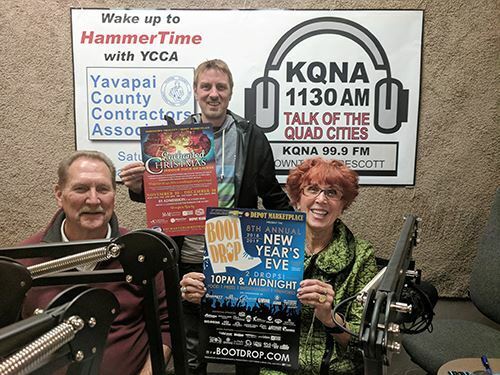 New Years Special: A Re-broadcast of the very first Hammertime program from July 9th, 2011 on the history of the YCCA. 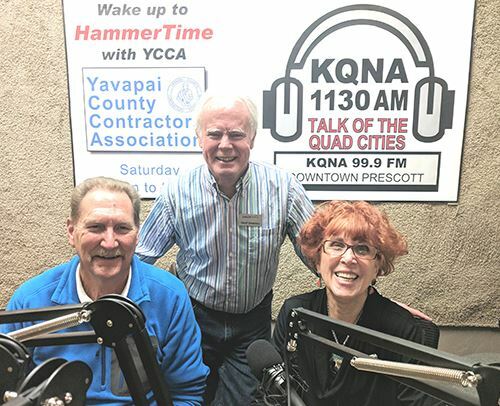 Guests: City of Prescott Community Development Block Grant Administrator Darla Eastman, CDBG Committee Chairman Jerry Jones, and Prescott City Councilman Phil Goode. Guests: Leslie Jenkins, Director of Philanthropy for Yavapai Big Brothers/Big sisters, and John Gillis of A1 Office Plus. Guests: Yavapai County Supervisor Rowle Simmons. Guests: Yavapai County Supervisors Tom Thurman & Randy Garrison, and Camp Verde Mayor Charles German. Guest: Yavapai County Supervisor Craig Brown. Guests: Almeda Vandenberg & Faith Mehus of Footework Auto Licence & Title Service. Guests: Patricia & Richard Rosanova of the Happiness Candy Shop, and Dawn Wasowicz of Rafter Eleven. Guest: James Todd of Arizona TV Worx. Guest: City of Prescott Chief Building Official Randy Plumber. Guests: Nicki Bagley of Arizona Vineyard Consulting, and Prescott Mayoral candidate Greg Mengarelli. Guest: Prescott City Councilman Steve Blair. Guests: Vickie Johnston, The National Sales & Marketing Director of the Ultra Water Bar Health Store. 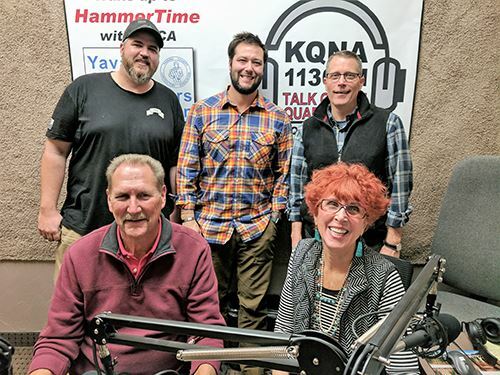 Guests: Mike Daniel of Ability Remodeling & Home Services, and Lori & Rick Lewis of Prescott Window and Door. Guest: Ed Walsh, General Manager of Lamb Chevrolet/Cadillac & Lamb Nissan. Guest: Suzy Bergen of Earthworks Landscape & Supply. Guest: Thomas Liuzzo, land surveyor with Granite Basin Engineering. Guest: Big Brothers/Big Sisters Event & Community Outreach Coordinator Nancy Hammerley. Prescott Valley Events Center General Manager Scott Norton. Guest: Nancy Deane of Last Shadow Apiary. 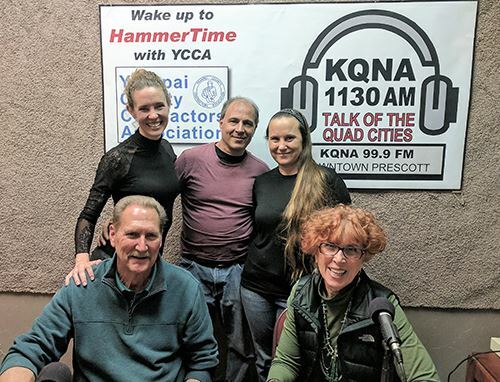 Guests: Darlene Packard & Ron Fournier on the Prescott Valley Healing Field & Patriot Run, and Amber Lyn of Amber Lyn Upholstery. Guest: Candidate for Prescott Mayor, Greg Mengarelli. Guest: Candidate for Prescott Mayor Mary Beth Hrin. Guest: Prescott Councilwoman & candidate for Mayor Jean Wilcox. Guests: Prescott City Councilmen Steve Blair & Greg Lazzell. Guests: Sonny Gallegos of Amazing Foot Spa, and Prescott City Council candidate Phil Goode. Guests: Prescott Salvation Army Community Outreach Director, Michael Beauchamp. 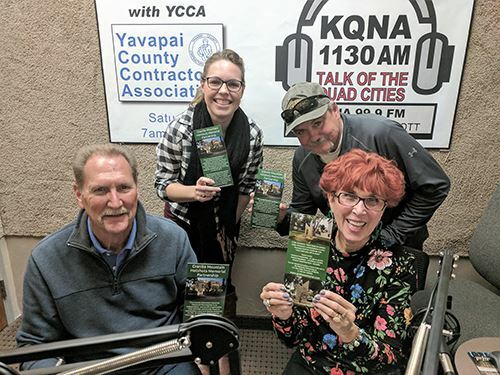 Guests: Brian Walker of Cowboy Critter Control, and Juliana Goswick of Yavapai Big Brothers / Big Sisters. Topic: The Boys & Girls Clubs event "Dancing For The Stars". Guests: Rakini Chinery, Jessica Bailey, & Jim Barry of Allan's Flowers, and Todd Maroff of Headwaters Architecture. Guests: Steve Ewing of U-Pick It, and Ramiro Alvarez of Home Tech foundation systems. Guests: The Executive Director of the Sharlot Hall Museum, and Matt Moss of Moss Piano Tuning & Moving. Guests: Christy Kukuk of LuLaRoe, and Candice Ward & Pauline Likes of the Modified Dolls. Guests: Zach Hoyt of Solar Scrubbers, and Randy Litwin of Blazing Sky Energy Group. 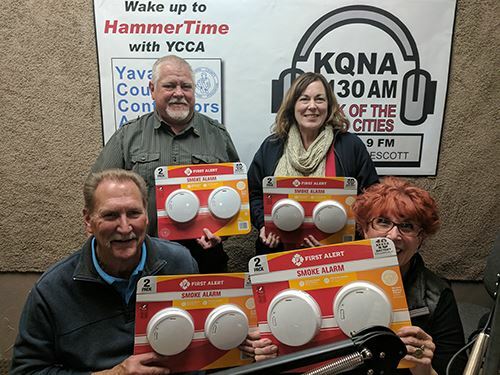 Guests: John Winfield of Top Hat Chimney Cleaning Services, and Capitol Canyon Club Marketing Coordinator Ann Steward.